We are sorry to be the bearers of more ill tidings, but the world economic crisis and multinational governmental fixes will continue to dominate the headlines. Expect articles on international cooperation and digging the change out of various Central Bank sofas. We were happy to hear that the head of the IMF stepped up yesterday to promise third- and first-world bailouts, with the proviso that they had "over 700 billions" to spare (loved the IMF pres then switching to French to deliver the good news - trés chic!). Let's hope for more of this - and some successes. *I believe because it is absurd. But don't let's get too cocksure thinking it will be "that one" by a landslide. Despite some early good numbers, it's too early to know and irresponsible to speculate. First, there's all sorts of polling biases. Not to mention that the Queen herself has the electoral stigmata of polling blisters from heel to palm after days of Virginia canvassing. There's plenty of white-guy hostility out there (some of it even directed at little blonde 9-year-old Obama supporters). If you think this will be a cakewalk for the Big O, we've got some Gore/Lieberman signs in Florida to sell you. 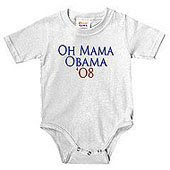 It's the most ambitious ad buy to date this election season. (If it doesn't work, maybe the candidates also have a little extra cash to spare for Freddie or Fannie?) The Obama campaign has purchased a full half-hour of primetime ad space on CBS for October 29 at 8 p.m. Will this be an FDR-style fireside chat about the sacrifices Americans need to make to get us back on track? An effective biographical sketch to counteract the "Who is Obama?" RNC strategy? Or a wasted half-hour of top-dollar-Democratic-consultant-inspired tired campaign slogans? OMG, the suspense! The GOP is worried about voter fraud! Stop laughing. Ok, chuckle a BIT. The party of Diebold and Kitty Harris is now alleging that ACORN is submitting questionable voter registration rolls in over 10 crucial states. Expect this to be a burgeoning talking point for the McCain flacks as Election Day looms. And expect push back from people who AREN'T being registered who should be. The Supreme Court is on the brink of deciding a major case that can impact workplace discrimination and the way private enterprises can investigate their own personnel. This has huge repercussions for non-profits who specialize in workplace fairness and gender equality. We are sure to hear much more buzz from the DC fold when the Supremes render their final judgment. And welcome to Kingdom Come. It appears that Guns 'n' Roses album Chinese Democracy, which has been slated to be released repeatedly for the last 14 years, is finally coming out in November through Best Buy. Rawk. But if this is your gateway to modern music, um, wow. E-mail our Culture Minister STAT to get your head in the game. 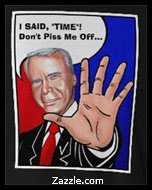 The hot topic regarding Tuesday night's debate seems to be less the candidates and more Tom Brokaw. Right-wingers spin that Tom "lost control" and allowed it to be a "tepid debate." Others claim it was the worst debate in the history of western civilization! Or it was just plain boring. But when your only points of comparison are campaign rallies that resemble Bircher meetings, you don't have much to stand on. Even though summer has drawn to a close, apparently flip flops are still in high fashion among fall interns, with even McCain's representin'! Remember that mortgage plan he proposed on the fly during Tuesday's debate? By Thursday it was kaput. That steady hand at the till seems to get shakier by the day on the economy. How is it that he still, at long last, hasn't settled on any economic messaging? After huge amounts of ugly backlash, the folks at AIG has now decided that their usually swank conference at the Ritz should perhaps be postponed this year, since taxpayers would be footing the bill. Wise idea, guys, but late, dontcha think? And now the Senate wants hearings on how the giant is squandering our moolah. Is anyone surprised by the Sarah Palin hate rallies? Luckily, newspapers of record are covering them, and the blogosphere is a-dither. Let's just hope they don't extend to the Palin opening puck-drop at the Flyers game Saturday. Will this be a dramatic and possibly hubris-filled photo-op? To quote Mommy Moose Hunter: You betcha! This one is severely under the radar, especially for a story depicting a growing and urgent trend: Yet another Gitmo prosecutor has resigned due to the kangaroo-court atmosphere of the hearings at the infamous institution. Progressive institutions need to track these guys down and get their testimonials on what's been going on the past seven years in our detention centers. Make it an issue. And the new "Jane Fonda for Despots" has arrived! The Vladimir Putin instructional Judo DVD (no, really) is your best tool on how to hurt friends and kill interesting people. Hey, it's this or a Hugo Chavez Tae Bo class in spandex, and he isn't competing with Billy Blanks anytime soon. "Where is my TR?" screeched one faithful reader when we went late to press last week. "Please put my name back on your list" begged others. Sorry, not quite sure what happened. Maybe our e-mail program is managed by... Diebold? Check you next week. Have a great 3-dayer if you're a lightweight. If you're a Washingtonian, don't bother coming in Sunday if you're not in the office Saturday. Sarah Palin's popularity reminds me of the “American Idol” voting from the public – where some of the worst people are allowed to stay on the stage (i.e. the "Sanjay Scandal")just because their friends and families flood the 1-800 number to vote for them. When in fact, their talent really doesn’t justify them being there. Where is the Simon Cowell of the political arena!??????? If it were up to Simon, I don’t think Sarah would have made it past the auditions!!!!! Is Sarah Palin the Sanjay of American politics? Or is she a hot brunette version of George Wallace?